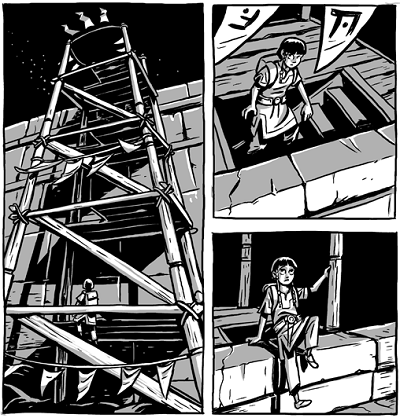 Over the Wall is an 84-page completed comic about a spunky kid who busts into a forbidden, not-entirely-abandoned city, and her adventures therein with a chatty, possibly demonic companion. 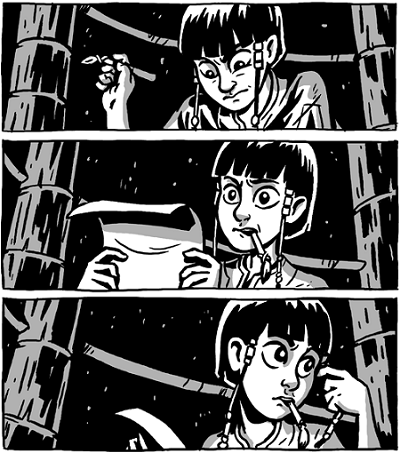 For some reason I find myself focusing on the paneling of this comic. The layout in Over the Wall isn’t particularly flashy or experimental, but it is very straightforward and effective, propelling the eye from one image to the next without confusion. I’d go so far as to call it textbook - I think an aspiring comic artist could learn a lot from studying it. The same could be said about most aspects of the art. It may not go out of its way to appeal to fandom fetishes, but it is very proficient and conveys a lot of information - I especially love the panels at the top of this post, where the girl pulls her braid out of the way of her brush to keep ink out of her hair. It’s a small touch that’s easy to miss if you aren’t paying attention. The art is full of details like that, but it doesn't yell HEY LOOK AT HOW GREAT I AM, preferring to hang back and support the narrative. So how is that narrative? As a stand-alone story it’s good, but probably not great. I felt that such a relatively high percentage of the comic was spent establishing the characters and the world that there just wasn’t that much time to do things with them. That being said, when the story hit its climax I was surprised at how much I was effected by it - there’s a deliberate mournfulness to it that has stuck with me since I finished it. What Over the Wall really succeeds at is creating a setting that I’m invested in and want to see developed further. The narrative seeds planted in this story have the potential to blossom beautifully. Fortunately, Peter Wartman promises that he has more stories in this world to tell, after he publishes a revised version of Over the Wall the summer. 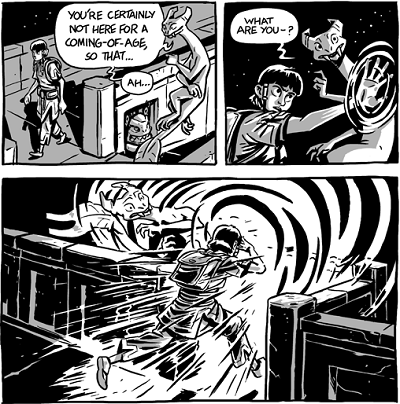 I’m looking forward to seeing the final, published version of this comic, and especially what comes after it.